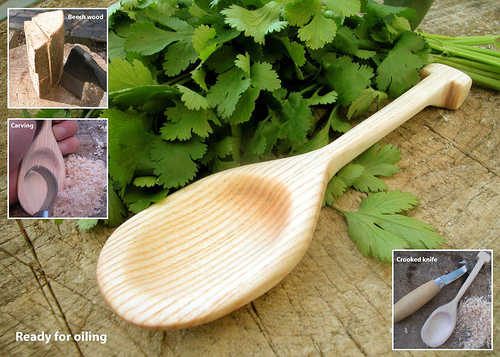 Just a quick simple photo guide to making wooden spoons. Using an axe take a slice out of a piece of wood (I used beech for these two different styled spoons) about an inch thick and 12 inches long (depending how long you want it). Then with a marker pen draw out the shape of the spoon on the wood and cut out the shape roughly with a small hand saw. Once you have the rough shape, start carving with a small knife until you are satisfied with the shape. 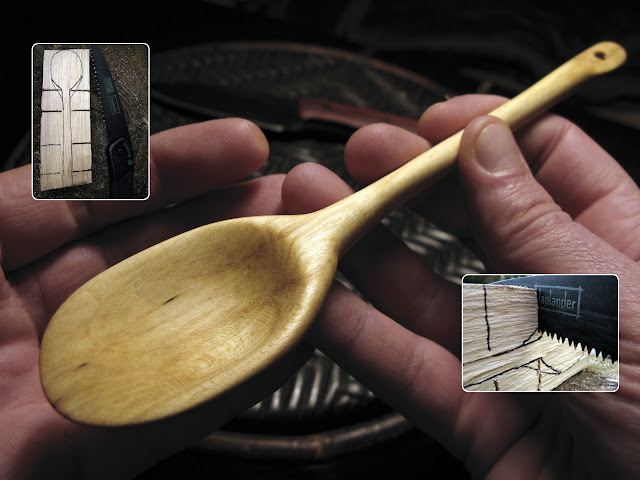 You will need a special knife called a 'crooked knife' for carving out the actual bowl of the spoon. Fast forward and much sanding later all done. When it comes to oiling I usually use a light edible oil like walnut oil. I've used mineral oil with success too. Since it's sometimes used as a laxative, it's harmless, and trace amounts won't have any "effects" on you.